While people expect faucets to run and toilets to flush without fail, they cannot be expected to pay massive bill increases that will be needed to repair and modernize an aging and increasingly break-prone system of buried municipal pipes that makes everything possible. That was the message in Albany City Hall on Wednesday from local elected officials to U.S. Environmental Protection Agency regional Administrator Judith Enck and U.S. Rep. Paul D. Tonko. Meanwhile, outside City Hall, opponents rallied against massive crude oil trains coming into Albany. "We're putting thousands of New Yorkers and the environment at risk to transport just 5 percent of our total U.S. oil consumption. 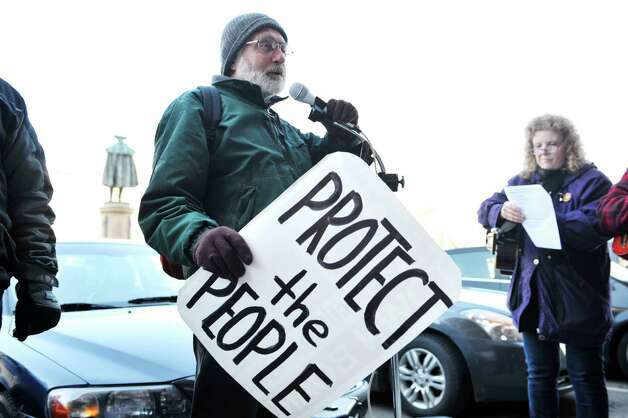 Leave it in the ground," said Sandy Steubing, of People of Albany United for Safe Energy, before a rally of about a dozen opponents. Pete Looker, a member of Schenectady Neighbors for Peace, said, "I see hundreds of rail cars each day through my window, knowing we and our local schools are within the one-mile blast zone from which our emergency responders can only try to evacuate people." Describing the Capital Region's water and sewer systems as "hidden spaghetti," Tonko said the city of Albany, for example, has 372 miles of pipes, or enough to nearly reach Washington, D.C. Among many water pipe breaks that city crews repaired this winter, said Albany Mayor Kathy Sheehan, was a pipe on Central Avenue installed in 1875 — when Ulysses S. Grant was president. "This is more than just about fixing leaky pipes," said Sheehan. "It is about reinvesting to continue to grow jobs." Sheehan was joined by officials from Troy, Colonie, and Green Island who also shared tales about looming expenses to repair water and sewer systems that are wearing out. "We need help," said Troy Deputy Mayor Peter Ryan, who added the city has raised its sewer rates three times in three years, and still faces potential modernization bills that it can never hope to bear alone. Colonie dealt with 140 water main breaks this winter, said Colonie Supervisor Paula Mahan. "It never ends," she said. She said the town will need "millions and millions" to rebuild its system. According to the state Environmental Facilities Corp., there are more than three dozen such repair projects awaiting funding in the 10-county region that total nearly $178 million. Rensselaer County has eight projects for $41.5 million, while Saratoga has five projects for $42.5 million. Albany County has six projects for $22.8 million and Schenectady County has one project for $3 million. Federal aid to rebuild water systems that is funneled to states has primarily been in the form of loans that have to be repaid. "Loans are lovely, but we need grants," said Mary Beth Bianconi, a project manager with the Albany engineering firm of Delaware Engineers P.C., which consults with localities on how to finance and construct such projects. For the first time, a portion of federal water system aid funneled through EPA to states, and then in turn to local governments, can be given as grants, rather than loans. Last month, the state got $150 million, and can award $46 million as grants. But the federal aid represents just a small portion of the work that will have to be done. The state estimates over $37 billion is needed over the next two decades to repair and restore local wastewater infrastructure, as well as $38.7 billion for drinking water infrastructure. "There are no easy solutions," said Enck. Funding decisions for such aid are made by Congress, and the current Congress has a philosophy more aligned with cutting taxes and government spending, than offering more aid. Enck said pressures on water systems likely will get worse in coming years as climate change produces more intense storms. Tonko said fashioning a federal solution to the problem could involve a combination of methods to cut expenses, share services and "fairness on taxes." Local governments in New York are under pressure from the 2011 state-imposed local property tax cap, which limits local property tax increases to no more than 2 percent or the rate of inflation, which ever is lower. Local governments can exceed the cap only through a super-majority vote of lawmakers. Thanks to Brian Nearing of the TU for covering our protest as well as the essential conversation on water infrastructure that was taking place in city hall.